Dennis J. Swenie was the first paid Chief Engineer of the Chicago Fire Department and served in this capacity until March of 1859 and again form November 10, 1879 to June 1, 1901. 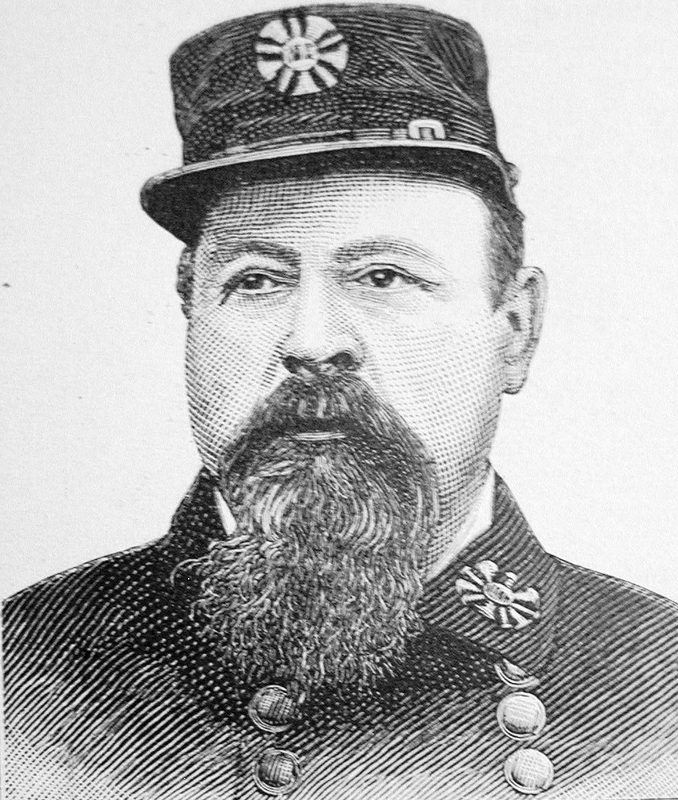 Denis Joseph Swenie, Chief of the Chicago Fire Department, was born in Glasgow, Scotland, July 29, 1834. His father, John Swenie, and his mother, Ellen (McAlice) Swenie, were born in the North of Ireland, and his father was a tailor by trade. Company, No. 7. In 1867 it was changed to No. 14, with the Fred Gund engine, named after one of the Fire Commissioners. During all of these changes the old Volunteer Fire Department was gradually going out of service, but the organization was kept up until 1863, when the last company, the Northern Liberty, at Larrabee street and North avenue, disbanded. He was in command of the Fred Gund in the great fire of 1871, and it was lost in the rush of fire at Canal and Van Buren streets. The company under his charge then took Coventry Engine, No. 11, and after arduous service saved four squares, from Market to Michigan street on the North side. In September, 1873, he was appointed First Assistant Marshal, and served until July 3, 1879, when he was made Acting Marshal, vice Matt Benner. 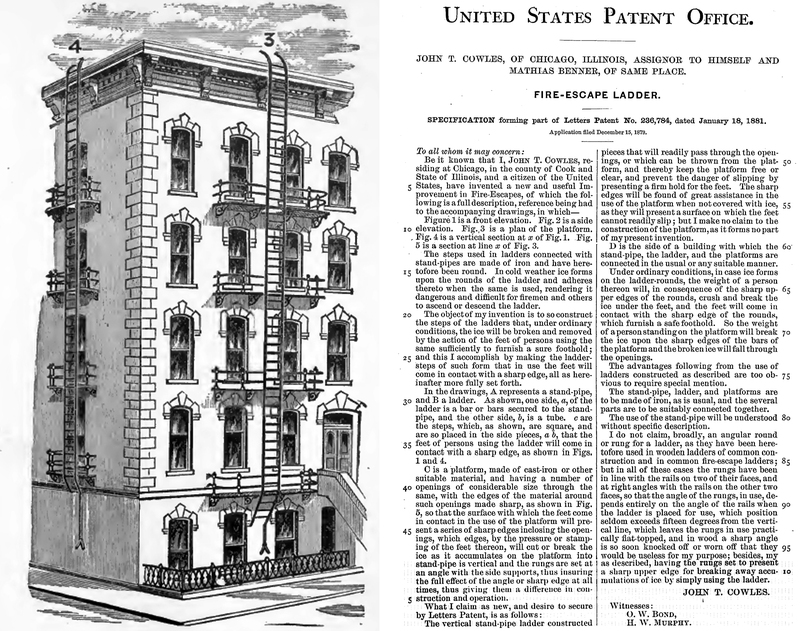 In November, 1879, he was created Chief, to succeed Matthias Benner, the veteran fireman who embarked in the manufacturing of fire-escapes. In the traffic he is eminently successful. Chief Swenie is a wonderfully well-preserved man for his experience. He was present in all of the great fires of his day. In the great fire of 1857 he took charge of the diggers, and recovered eighteen bodies out of twenty-three supposed to have been lost. In the historical conflagration of 1871 his exertions saved five entire blocks in the vicinity of Kinzie street bridge. The Chief is a man of the most valuable information, secured mainly by extended travel. Mr. Swenie declined the nomination for sheriff on the Democratic ticket in 1886. In 1845, when I first joined, the department had no water works and we had to depend on the river for suction. We had a sewer running down Madison Street to State and down State to the river. The sewer connected with LaSalle, Clark, and Dearborn. That was our principal reliance for water, except for river, when it was too far away. No. 5, the Company I helped to organize lay on Randolph Street, on the west side of the Bridge. It was a two-story frame house with a meeting room upstairs. In the evenings, we used to gather around there, like at all engine houses, waiting for a fire. They were all strapping young fellows; but there are some who are now, like myself, old heads living still. Waits All Day for a Four-Eleven Fire, but the Alarm Does Not Come- Friends Visit Him and Talk of Old Times. Chief Denis J. Swente was 60 years old yesterday and waited all day In vain hopes that the event might be fittingly celebrated. His friends thought that nothing lens than a 4-11 fire do justice to the occasion, but there was no 4-11. The Chief demonstrates each year, In spite of advancing age, that he is a more active and vigorous fire fighter than he was the twelve months before. There is no day on which this capability could be more fittingly demonstrated than on the anniversary of his birth. And so while the Chief did not want a fire, because a fire entails loss to property and possibly to life, yet the Chief said that It It were possible to have a big 4-11 in which no one lost any money and nobody got hurt then he would like td have one, and he was ready to to out and put on the gloves with the fire fiend and demonstrate that he could run the fiend up against the rope and give him a harder punch than he has ever done since the days he used to “run wid de machine ” away back in 1849. The Chief sat at home most of the afternoon receiving the congratulations of numerous callers. Many incidents were called up and retold. The Chief did not remember so many as his friends did, at least he didn’t tell them. The Chief Is content to let others tell of his deeds lie Is content to fight the fires and let somebody else tell about it. He did remember, however, the terrible fire at the Northwestern cleaning elevator, at Indiana street and the river in 1897. That was perhaps the nearest to death that the Chief came during all of his long career. At that time his driver was killed and five other firemen, all standing near him, lost their lives. The Chief was blown fifty feet by the explosion which caused this loss of life. When he was picked up and came back to car, his first words were: “This Is the end.” When the explosion occurred and just as he felt himself hurled along the ground the thought had come to him that he wias about to die, and the first words when he came back to consciousness were those he would have spoken had he not been rendered Insensible at just that moment. We note that Denis J. Swenie, Chicago’s celebrated flre-chief, who died the other day, was a real Scotch-Irishman, having been born of Irish parents in Glasgow, Scotland. From all accounts he was a man of character, courage and brains. Born in 1834, he came to America when lie was fourteen years old, became a member of the old volunteer fire department of Chicago within a year later, and in 1858, when the change came to a paid department, he was the first foreman to organize a company, against bitter opposition. His experiences in service abounded in remarkable incidents. In the great fire of 1871 he worked without relief for fortyeight hours, and in the very height of the conflagration he passed the site of his home, to find it in ashes, and it was two days before he knew what had happened to his family. Many said that had his plan for fighting the fire been adopted, the calamity would have been of much less proportions. But that can never be demonstrated. Swenie became chief in 1879, and only retired last year, having missed a score of deaths by a mere moment, to die of a kidney disease. He was a great leader, and everybody had called him ” the old man ” for many years. He had been blown into the air by explosions, had been carried out of basements overcome by the smoke, in the arms of men who were as brave and devoted as himself, and had often escaped from falling walls by a matter of a foot or two. Dennis Sweenie was my great great great grandfather. I love reading stories about him. Charlene, he was mine too. Are you an Ebbert? I’m guessing Charlene is an Ebert (Patty) as am I (Dorothy). Small world! I wasn’t able to find you in my notes Bob, but I would like to add your in. Can I ask your parents initials? Andy, Charlene is an Ebbert. She is Pattie’s youngest daughter. I am the oldest daughter. Are you Aunt Dorothy’s family. That would be Raymond’s sister. Raymond is my grandfather. Hi Theresa. Dorothy would be my great grandmother, which I think makes you a second cousin to my dad. It is nice to meet you (electronically). I am Denis J. Swenie III, daughter. You are apart of the family we do not know about.